I met Wolf(Drago) in Granada about four or five years ago. 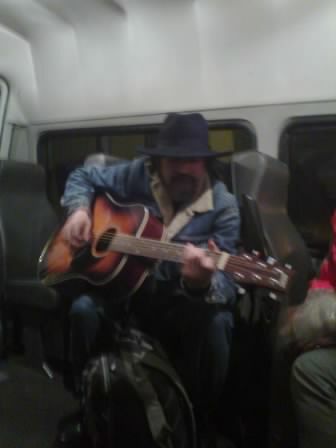 He was and still is a busker, making money with his guitar and singing, mostly Bob Dylan, Beatles and Bob Marley songs, although his repertoire is very extensive. I suppose it´s a matter of trying to please as large a portion of his audience as possible, when playing the terraces. He´s also written his own songs and has posted the lyrics to some of them here already. The Wolf I met again in Santiago is not the same one I knew before, when he was loud, really loud when drunk, which was most of the time, like all the rest of us then. Now he is sober, soft-spoken and a really interesting man to be with and talk to. I found out he graduated from an Academy of Fine Arts in Holland and used to be a respected artist(painter). However, he does not want me to go into that, so I won´t. His chosen career was that of sailor(navigator) and he told me some wonderful stories about that time. He has travelled and lived all over Europe and could probably fill a whole library with he has seen and been through. He has written a lot before, but his manuscripts were stolen along with the rest of his stuff on numerous occasions, as is the case with all of us who spend our lives on the street. This in short is Wolf, NOT just another of my friends. He´s a sailor, pirate(in jest), painter, busker and so much more. Welcome to the Portal, my friend! P.S. : His mother tongue is Servo-Croatian and he may post some stories in that language. We might get an Eastern European following from that over here.